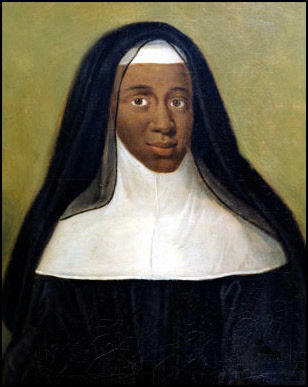 Louise Marie-Thérèse was known as the Black Nun of Moret. She is said to have lived her entire life in a convent but that she only took the veil at the late age of 31. The portrait shown above hangs in the Bibliothèque (library) Sainte-Geneviève, located next to the Pantheon in Paris. Rumors abound that Marie-Thérèse was the daughter of Queen Marie-Thérèse (Maria Theresa of Spain), wife of Louis XIV. The baby's father was reportedly the queen's African dwarf, Nabo. Others believe that Marie-Thérèse was fathered by Louis XIV and that her mother was one of the king's many concubines.